Well it’s about time isn’t it that I got me a posting about Game of Thrones – it has dragons doesn’t it, it’s about as big on dragons as anything in media… so why not post. Well ok it’s not really okie for kids, well little kids that is, in fact middling kids too could do with avoiding it but hey in this day and age I’m quite aware that rules like that don’t necessarily apply. So trying to stick to my code of ethics what can we do, perhaps promoting a DVD box set might not be best… but why not promote some wholesome acceptable board game, why not promote the biggest and best board game in the world (allegedly) and the biggest and best dragon-ish TV series. So Game of Thrones Monopoly it is. I was a great fan and player of Monopoly back in the days that dragons ruled the world. It was a great game when there were only three channels on the TV, nowadays though it may be a bit more difficult to tease your kids away for the X-Playtendo. 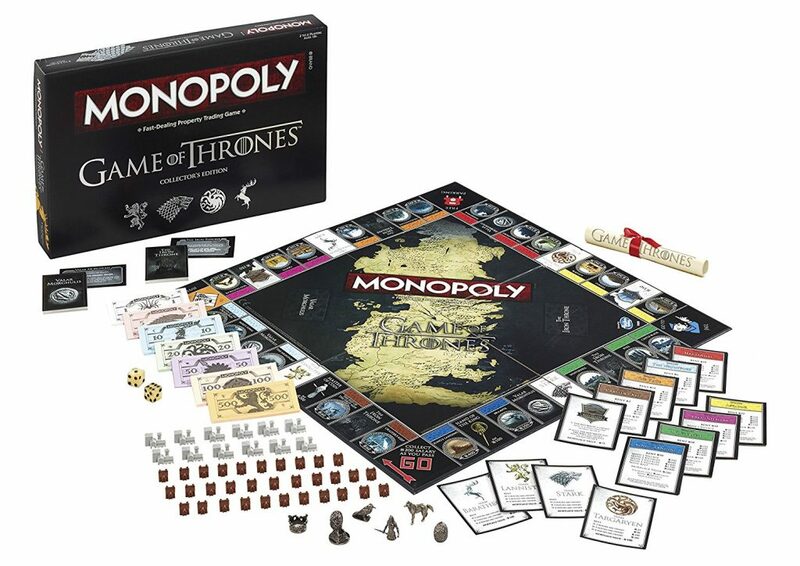 So why not use a bit of smoke and mirrors, sucker them into board games with the promise of the Thrones franchise, the promise of some tales of yore and not of bore, they may even get hooked. Who knows they may even spread their wings and start demanding some classic boot, top hat and racing car action. Anyway I’ve not got a copy of this game (I would love a sample though 🙂 hinty hint hint Mr. Monopoly ), I have however been reading reviews. Most reviews seem pretty satisfactory but there are some irked customers, the main gripe seeming to be the dice, yes the dice! There’s one version with antique faked up dice and the other with standard white dice, problem is the illustration seems to indicate that both versions have antiqued up dice, hence a tirade of narsty reviews. The Collector’s Edition – this is the cheapest option and comes with normal looking dice. The Deluxe Edition – this is £20 or more expensive and comes with aged dice. It however also comes with a foiled box, wrapped scroll rules, a printed board with the full logo, larger cards, parchment money, coated varnish on the board – anyway this is what I’ve been told, you may wish to check. Note: Both boxes are branded as “Collector’s Edition” but there is a small round sticker to differentiate the deluxe one (Deluxe Edition). Stuff like this can become very collectible, it can also become excruciatingly common too. My advice – for what it’s worth – buy the collector’s edition if you wish to play it and the deluxe edition if you wish to collect it. Does that sound contrary or what? Anyway it’s a great game to play by the gaslight and I’ll not forgive it if it hasn’t replaced the “Go to Jail” card with a “Go to the Dungeon” card.